The natural choice for environmental performance and comfort. Our new Kleenex Naturals tissues are made with SoftBlend Fiber which is the perfect blend of soft, virgin fiber and 20% post-consumer recycled fiber. 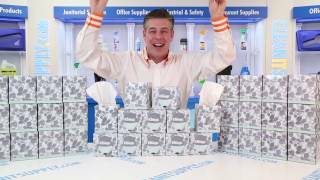 The result is a quality tissue that meets the high standards of the Kleenex Brand and also exceeds EPA minimum standards for post-consumer waste content in facial tissue. Each premium tissue is 8.4" x 8.4" in size and there are 95 white tissues per boutique box. Includes 36 boxes.